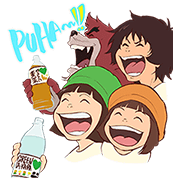 http://www.line-stickers.com/ – GREEN DA･KA･RA & anime film “The Boy and The Beast”Line Sticker | Summerʹs here, along with special stickers from GREEN DA KA RA! It may be cold out there, but GREEN DAKARA will always keep you cheerful. 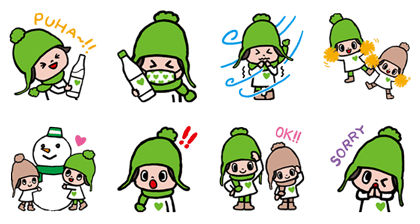 Summer is the season for GREEN DA･KA･RA and sheʹs back in her third sticker set! 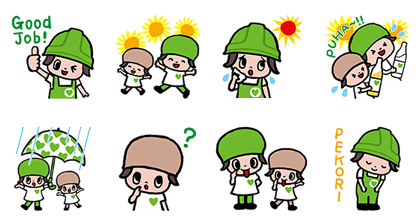 Summer is here and so is the 4th installment of Green Dakara-chan and the barley tea-loving Mugi-chan stickers! Keep cool on even the hottest days with these refreshing stickers. Friend Suntoryʹs official account to get this set for free. 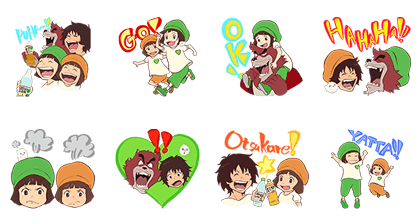 GREEN DA･KA･RA has teamed up with the hot new anime film “The Boy and The Beast” to bring you this ferocious set of stickers! Dakara-chan and Mugi-chan are looking cuter than ever alongside Kumatetsu and other characters from this exciting new movie. 8 stickers in all! 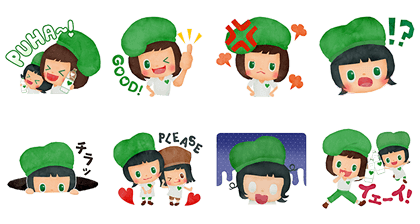 The clear, smooth citrus flavor of GREEN DA･KA･RA is teaming up with popular sticker creators to bring you this special GREEN DA･KA･RA-chan sticker set! Available till June 6, 2016. Copyright : Copyright © SUNTORY / illustration sachiko temmyo | CHIBASHIGE ILLUSTRATION BY! Next post Foxes Never Quit!